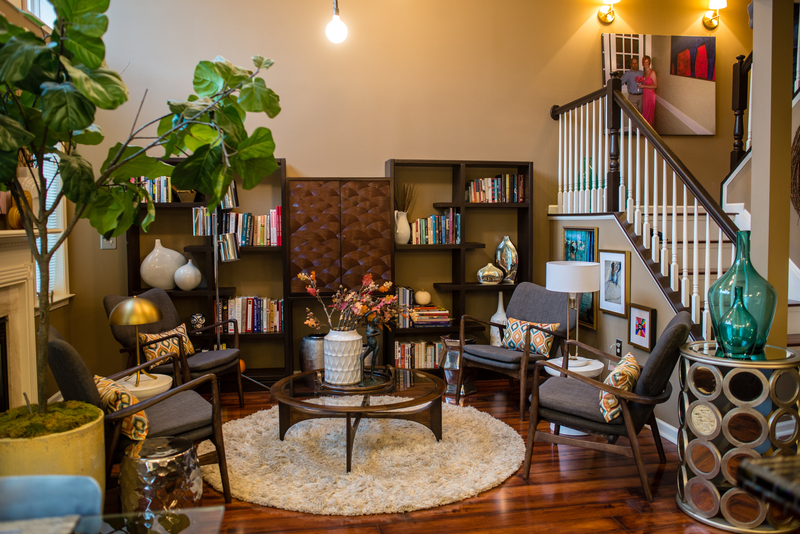 After a much-needed break in the sun, I thought we’d take our first trip across the pond to the USA to the home of Mel and Mitch in Pennsylvania for a real home tour. And I’m excited to announce that you too could have your home featured here on the blog by entering a new hashtag competition over on Instagram, but more of that after we’ve finished having a good look round today’s fabulous home. Today’s home is full of inspiration that has been born by Mel’s creativity and her multi-talented husband Mitch. It’s a partnership in creativity and craftsmanship that has them and their family reaping the rewards of their hard work and determination. 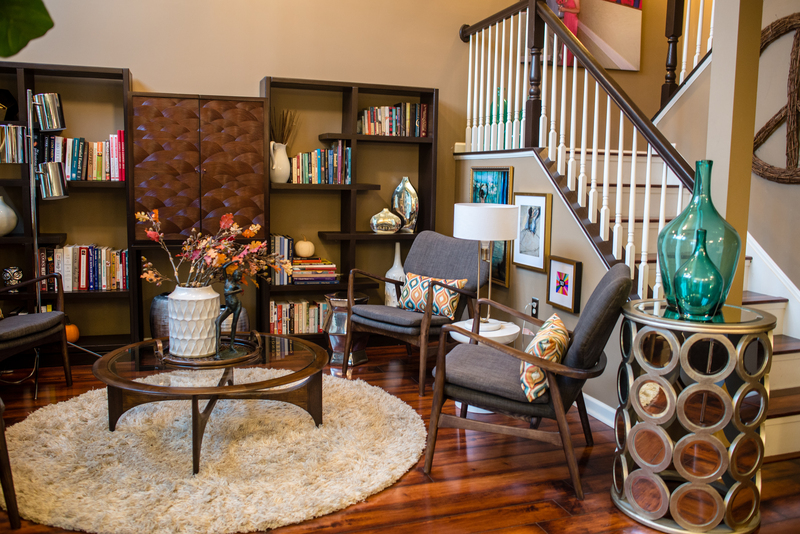 Every idea has been implemented to create a home that’s full of personality and character. A home that shows if you put your mind to something, you really can achieve a home of your dreams. Ready to take a look? Mel is a daughter of two college professors and has worked in education since she graduated in 1991. In addition to her passion for interior design, she also enjoys reading, yoga, running, singing in a church choir, shopping, and spending time with family and friends. Having been through a divorce Mel found her current home in 2009. She instantly fell in love with the open plan space and in particular the flow between the kitchen, breakfast nook and fireplace room. The fusion of styles that Mel has introduced into her home ensures that it’s far from being contrived. Offering you visual delights wherever you look. 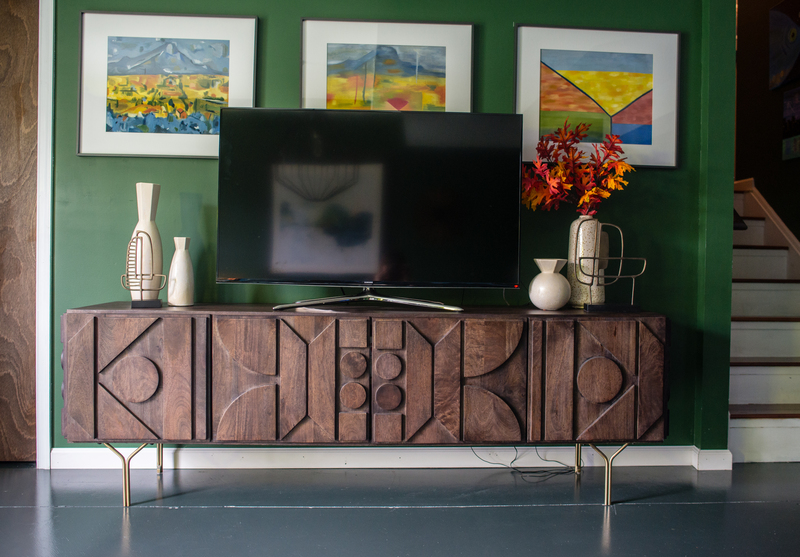 That said, mid-century modern style pieces provide longevity with their classic simple forms adding stability to the overall look and feel of their home. 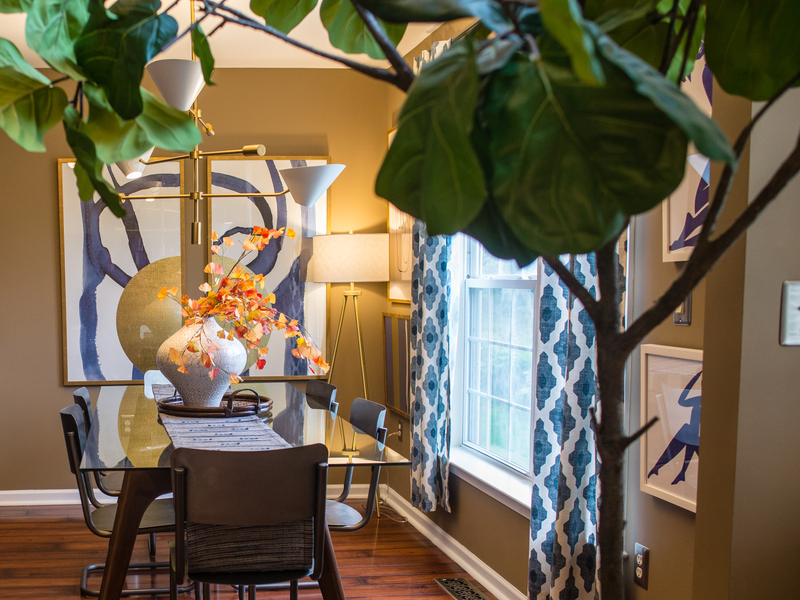 The giant faux fiddle leaf was a Houzz find. As anyone who lives in an open plan house knows, creating a zone that allows you to enjoy some you time is important for our well-being if not just to escape the kids! Mel and Mitch have achieved this perfectly with their fireplace area. It’s a space that allows them to take five and enjoy some downtime. And it is, perhaps, one of my favourite areas in their home and I could quite easily lose myself here for an hour or two. The bar cabinet from Crate and Barrel was one of Mel’s first home purchases (priorities-ha ha) and then Mitch built the bookshelves that flank it based on a picture that Mel showed him in a catalogue. Mel has used radial balance to create the perfect intimate cosy corner of their open plan home. The vintage mid-century Lane coffee table takes centre stage and was an Etsy find and is reinforced with the shag rug from Crate and Barrel. Radial balance is a great way to create a sociable intimate area especially in dining or seating areas such as this. Mel and Mitch’s two storey fireplace room has amazing double height windows that allow this area to be filled with lots of natural light. They’ve transformed it from a cream, beige and white area that is now full of character and detailed interest. The chairs surrounding the rug were an Amazon find, and the pillows on them change constantly. (true confession, Mel has a whole area in her basement storage room full of throw pillows and vases and botanicals). One of the reasons I absolutely adore Mel and Mitch’s home is that it is filled with meaningful and well-loved objects rather than just choosing accessories based on their decor alone. They have chosen objects that hold meaning to them as a family. The Degas statue above and the artwork is in fact in honour of her mother whose favourite artist was Degas and from whom Mel embraced her love of art and design. Another trait that she has inherited is changing her decor to suit each season. When Mel and Mitch remodelled their kitchen they kept to the same footprint as the original kitchen as it was the best use of the space. However, they did change everything within this space to suit their style and tastes. The island and cabinets are Tinsgryd from IKEA and the brushed brass pulls are from CB2. Mitch and I love to have family and friends over for dinner (to enjoy his amazing cooking) so this is our favourite entertaining spot. Folks gather around the island while he is cooking and there is typically wine flowing, jazz playing and laughter rolling. 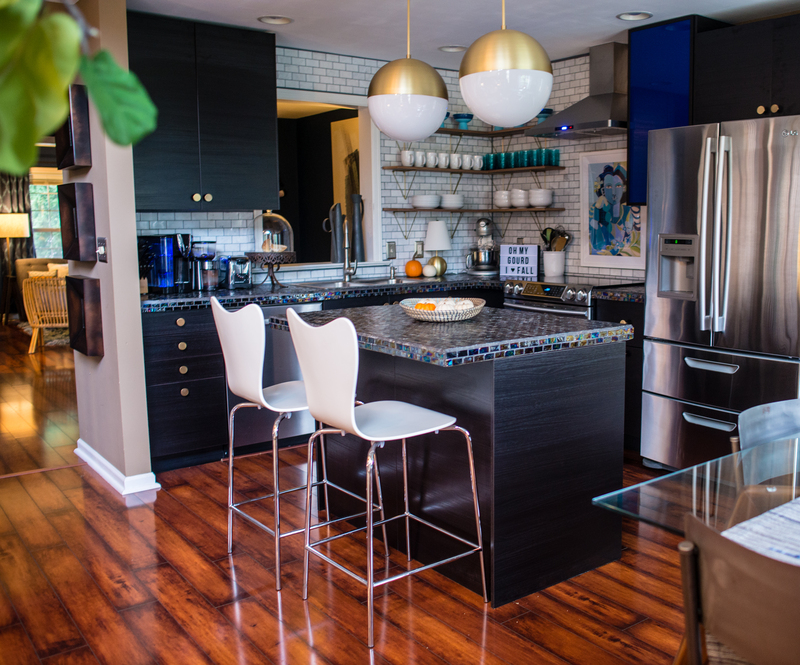 The iridescent glass brick kitchen counter tiles were a must have because Mel loves all things shiny. The open shelves by Pythagoras by Gustav Rosen Design are a great choice not only in terms of creating a display of Mel’s decorative tableware for ease and practicality but also in terms of opening this corner up. Wall units here would have made this part of the kitchen feel more enclosed and visually smaller. Taking the marble tiles to the ceiling is also another trick to bear in mind if you want to draw the eye upwards and make a space feel larger than it is. The white Carrera marble subway tile that Mel found on Amazon which contrasts with the iridescent glass brick kitchen counter tiles. One of the things Mel insisted on in her kitchen was the blue glass cabinet door which she had custom-made by Cronos Design and she adores it. Mitch installed in-cabinet lighting at her request but because the door is so opaque you can’t really tell that it’s turned on but then that’s the joy of creating a home don’t you think. Some things work out just how you planned them and others not so well. It’s part of the fun of building a home. My favourite part of this room by far is when Mitch is in it and cooking us yet another amazing meal. I am blessed! As an art lover, Mel couldn’t resist getting Mitch to hang this fab print by Hayley Mitchell above their range. To be fair you might think this is totally impractical, but if like Mel you love something, there really are no boundaries as to how you style your home. It’s whatever works for you and ultimately what makes you happy don’t you think? Wonderful decorative lighting abounds in Mel and Mitch’s home mainly in the form of pendants like these globes from Cedar & Moss. They’re Mel’s favourite part of the whole room and to be honest mine too, but then I would say that as someone who is obsessed with lighting. The abstract nudes are by Elizabeth Lever and the peace sign is from Chasing Paper. The other three pieces are from The Arts Capsule, an LA-based artists cooperative. The cheery mid mod curtains are from West Elm. Glass is a wonderful medium to introduce to your homes, especially in smaller spaces. It allows the eye to see through it creating the illusion of space. Although Mel’s breakfast nook isn’t particularly small in size her choice of Hesse dining table does allow us to see more of the space through and around it unlike a solid wood table would have. The use of pattern and colour through art and soft furnishings softens the masculine lines too, adding a touch of femininity to this space. The glass-topped Hesse dining table from Joybird and is surrounded by vintage style metal schoolhouse chairs from Restoration Hardware. Mel has perfected the art of mixing up styles fusing them together to create a cohesive design scheme with each carefully chosen piece complimenting each other. The mid-century style table and light fixture from West Elm sits comfortably with the vintage 19th-century schoolhouse chairs. The antique photograph that watches over this room is of my grandmother Lucy (my daughter’s namesake) when she was a little girl, a piece I inherited from my mother when she passed away in 2016. The lovely wooden chair in the corner was also from my mother, a piece that travelled with us from house to house in my childhood. 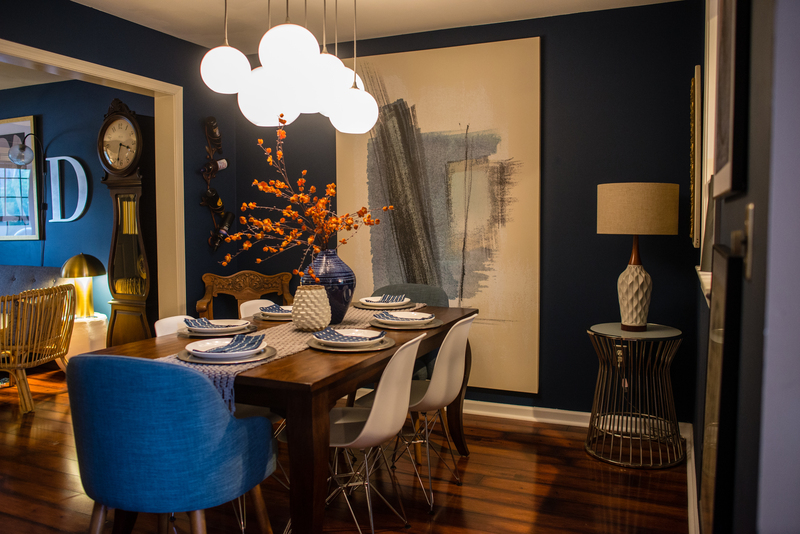 This area of Mel and Mitch’s home sat completely empty for the first year that they lived here and as a result, the dining room evolved gradually to become what it is today. I actually think it’s a good thing to do especially when you move into a new home. Taking time to see how you’re going to use areas of your home before decorating so that you get a feel for a space before committing hard earnt cash at it. Mel’s first purchase was the Pottery Barn table followed by the mid-century modern style chairs that she found on Overstock. The Platner style table in the corner is a favourite of Mels that she found on Amazon. The blue chairs are from West Elm and it’s no surprise to see this colour in this room as it appears throughout Mel and Mitch’s home. Mel has cleverly used different shades and tones of blue throughout her open plan home in various forms from artwork, furniture, and accessories. All of which helps create a cohesive flow from one area to the other through the use of colour. I added two of my favourite prints from Picasso and a floor to ceiling abstract piece and have no idea who the artist is. People often ask me about the light fixture which is from West Elm. I was so excited when Mitch hung this because there was no overhead light in here at all when I moved in! Wherever you look, Mel has imprinted her eye for design with attention to even the smallest of details. 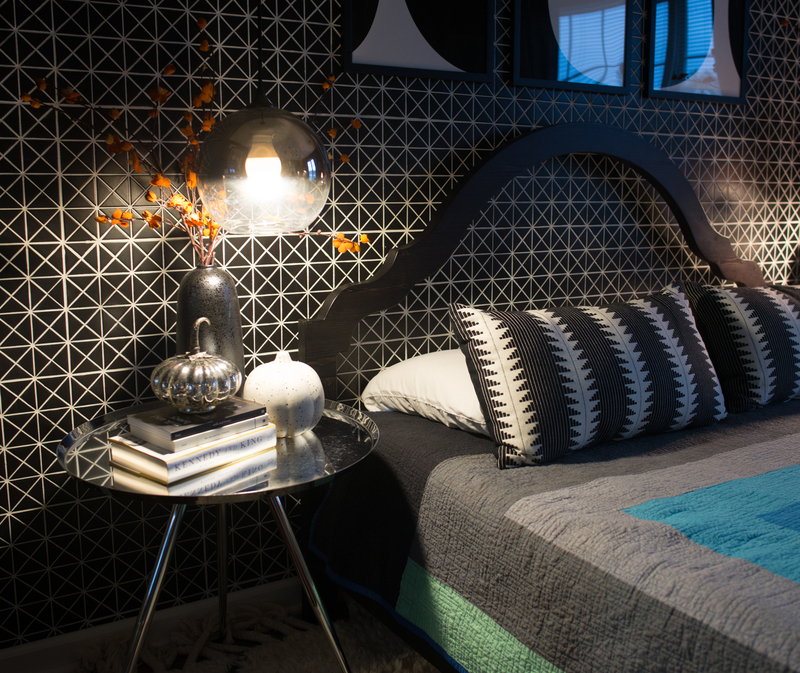 Pattern and texture exude offering visual and tactile delights that seamlessly blend in with their surroundings. 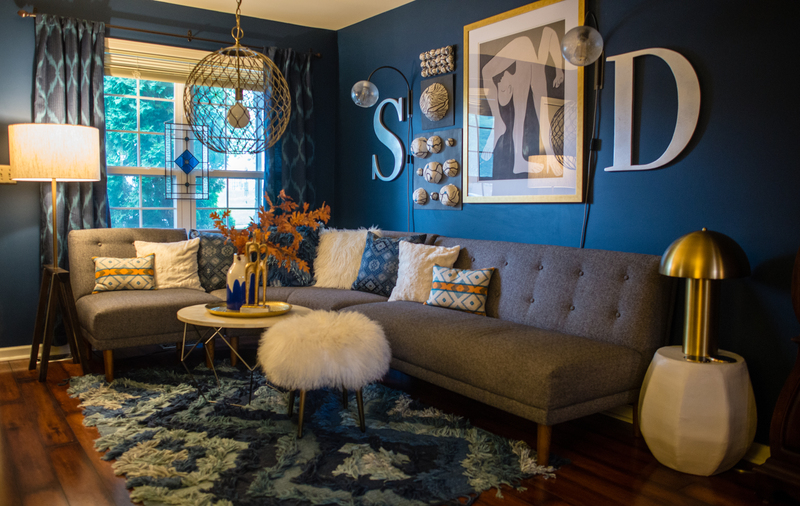 The rounded retro sectional that now lives here was one I obsessed over for a year before receiving as a surprise from Mitch on my birthday, and it now sits on a blue shag rug by Justina Blakeney. The family room happens to be the first room you walk into when you enter Mel and Mitch’s home and it was important for Mel that the overall look was one that was inviting and cosy. And like the dining room above, it has been a room that has evolved from utilising this area and learning how they wanted the space to look and feel. The sawhorse lamp by the door was made by Mitch after Mel showed him a picture of one in a catalogue. How lucky is she to have such a talented husband! Again, we see meaningful objects displayed in this family room with the three paper pulp retina sculptures that Mel’s daughter made in high school hanging over the sofa. The grandfather clock is one of the few items that Mel brought from her former home and is from Horchow. It has never worked but Mel doesn’t care because she loves it so much! The bar is topped with pennies that Mitch and Mel placed themselves and Mitch poured acrylic over to seal them. They shared a bottle of wine as we did this project together, and later had to add some dimes, nickels and quarters to make it all fit! I’ve always wanted a basement and am completely in awe of how Mel has designed this area of her home. It’s a result of obsessive mood boarding and planning to create an area that is functional and also fun at the same time. 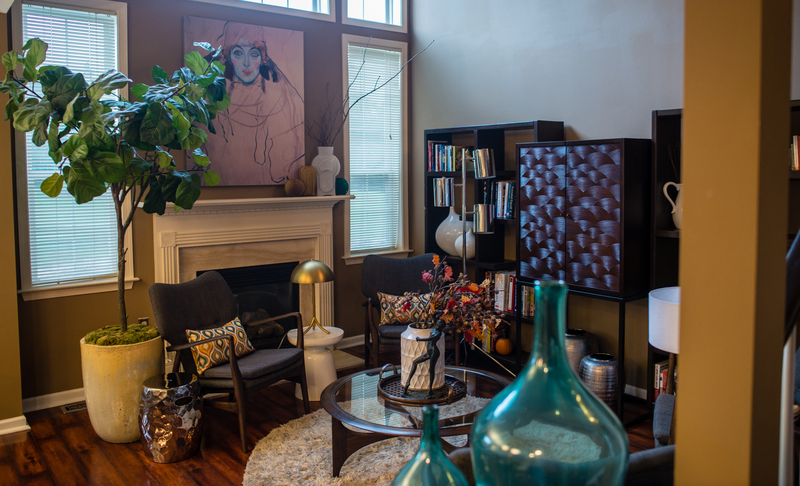 Mel’s initial plans were to only furnish it with a tv lounge until her mother gifted her some funds which allowed her the freedom to redesign the whole space. This multifunctional space excels itself from a table for playing games/puzzles to a coffee bar and a bumper pool table. All were designed to make having friends and family over more fun, especially with their children. And like Mel, I have to say my favourite area of this room is the seating lounge area which was inspired by the Lubna Chowdry tiled coffee table that you can see below. The basement walls are painted in Courtyard by Sherwin Williams which compliments the mural behind the bar area giving it an autumnal vibe Mel’s favourite season all year round. Forget the old adage of blue and green should never be seen because of Mel’s ability to use both she shows just how wonderful they are when combined together. They’re Mel’s favourite colours that you’ll see used throughout her home. 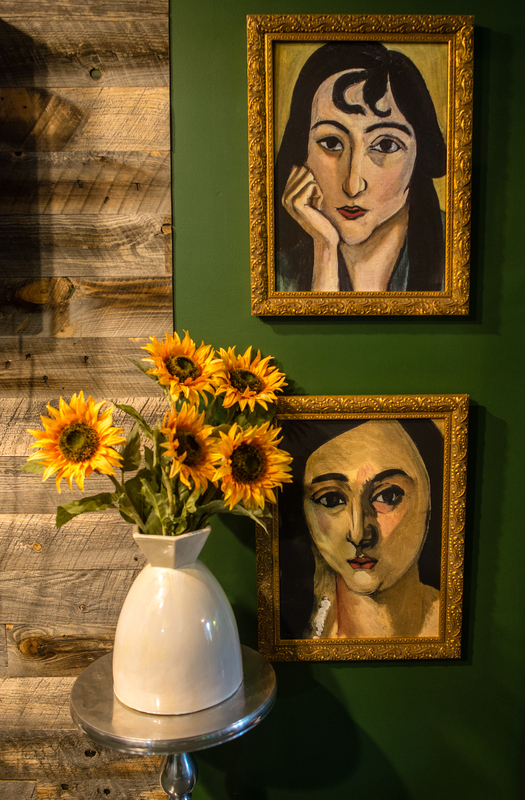 As with the rest of Mel and Mitch’s home, you’ll find more of their favourite artwork on display in their basement. The trio above was gifted to Mel by her daughter Lucy and is an art progression of Mont Sainte-Victoire by Cezanne that she did in a painting class she took at George Washington University. 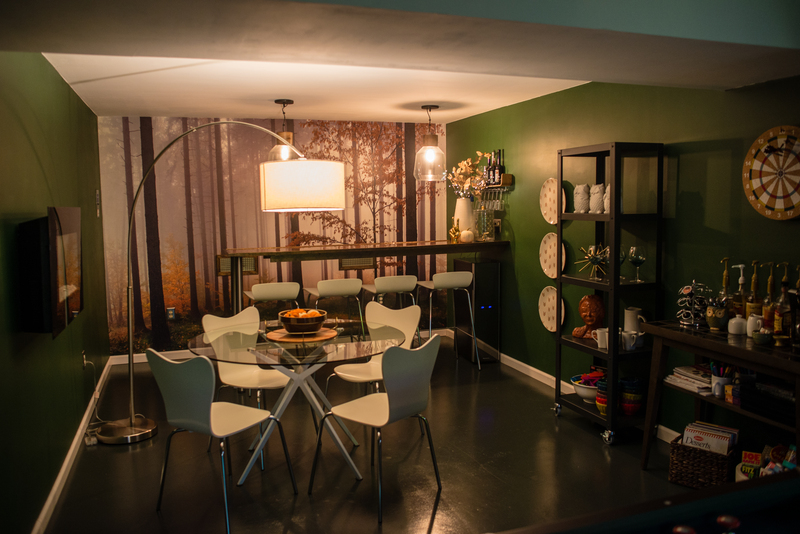 As a self-confessed sweetie addict, this snack area in the basement that Mel has created is pure heaven! I’m afraid I’d find it hard to leave it and it also happens to be Mitch’s favourite football game watching spot and I’m not surprised either. Right, where are the jelly babies?! The framed pencil sketches Mitch drew for Mel while they were dating. If there’s one area where you can have fun with it has to be the powder room or downstairs loo to you and me. Mel has done exactly that adding a crazy wall mural by New Era Studios. I personally love the boldness of its design. Mitch’s craftsmanship shines here in the powder room transforming this former nightstand from Hayneedle into a wash basin by adding a sink and antique brass faucet from Kohler. Inspiration is everywhere when it comes to making our homes unique to us and Mel has an eye for the unexpected. 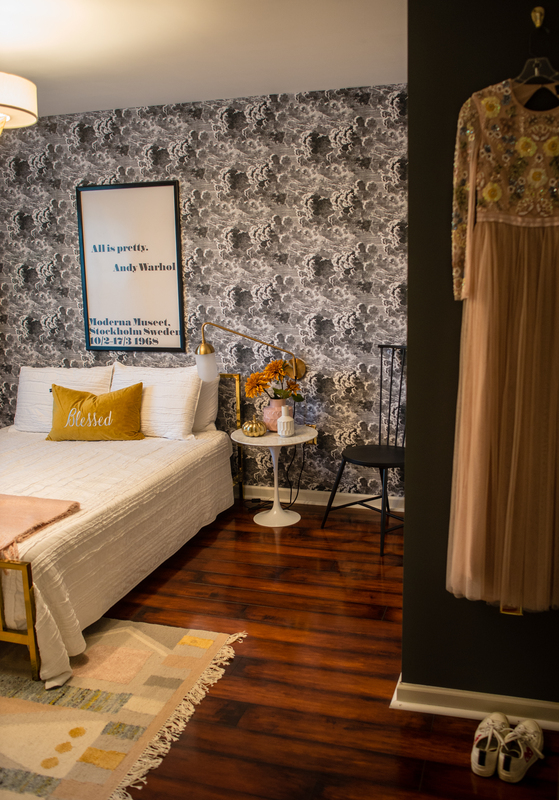 Mel took her inspiration from her daughter’s Needle & Thread prom dress for the overall look and design of her daughter’s bedroom. Adding a feminine air with elements such as the Klimt style rug, the soft rose colour throw and the delicate art that hangs on the wall in one of the corners. It counterbalances the grey moody wallpaper from an Etsy artist and darker grey velvet curtains. 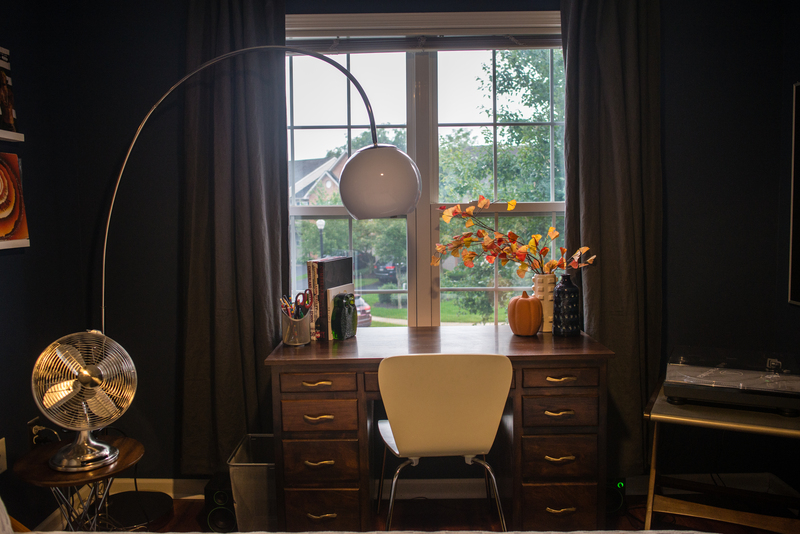 The dresser is from Anthropologie and the mid-century modern style lighting are all from West Elm. Mel likes to visit this room whenever she is missing her daughter as it helps her feel connected to her again. Another favourite space that Mel cherishes. The guest bathroom was literally finished last Friday. The multi-talented Mitch tiled one wall with aquamarine penny tiles from Lowe’s and the floor with white hexagon tiles from Home Depot. Mitch also turned a Penelope dresser from West Elm into a fabulous mid-century modern sink topped with a vessel and faucet from Signature Hardware! I think it looks absolutely amazing don’t you? I’m not surprised that Mel loves this room! The shower curtain is from Anthropologie and one of one million that Mel looked at online before deciding on this one. 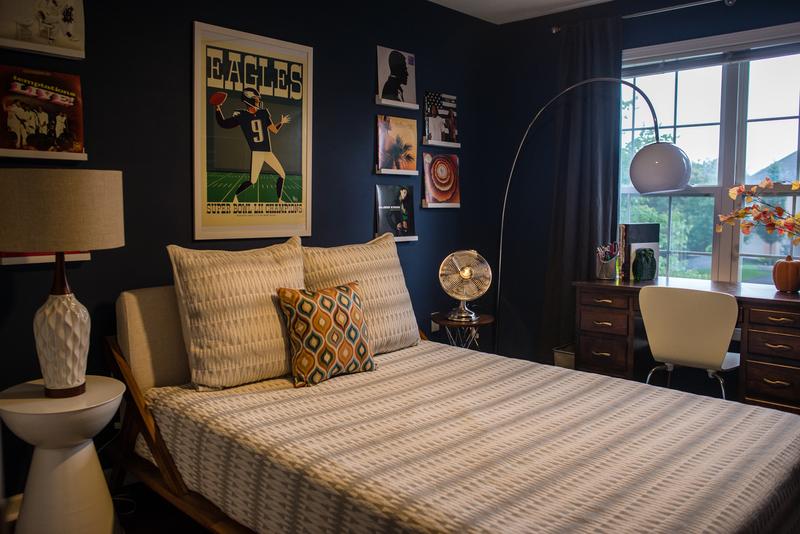 Joey’s mid-century modern style platform bed and green shag rug are both from CB2, and his mid mod desk was built by Mitch back when he was a teenager himself, and he has refurbished for Joey to use. Another room that has taken time to create is Mel’s son Joey’s room. Children evolve so quickly as do their interests and personalities so taking time out to create their perfect haven is a must. Joey likes to cave in his room and listen to music so this room is the perfect space for him. Talented Etsy quilt artist Scott Case custom made the coverlet for Mel, which has turned out to be her favourite thing in this room. 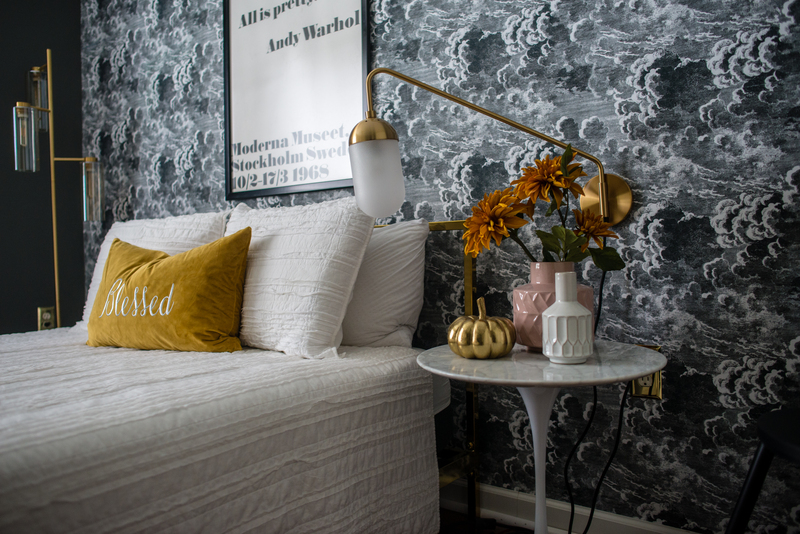 The master bedroom makeover started with Mel’s idea to paint the walls black which tied in nicely with the silhouette bed Mel found from CB2. 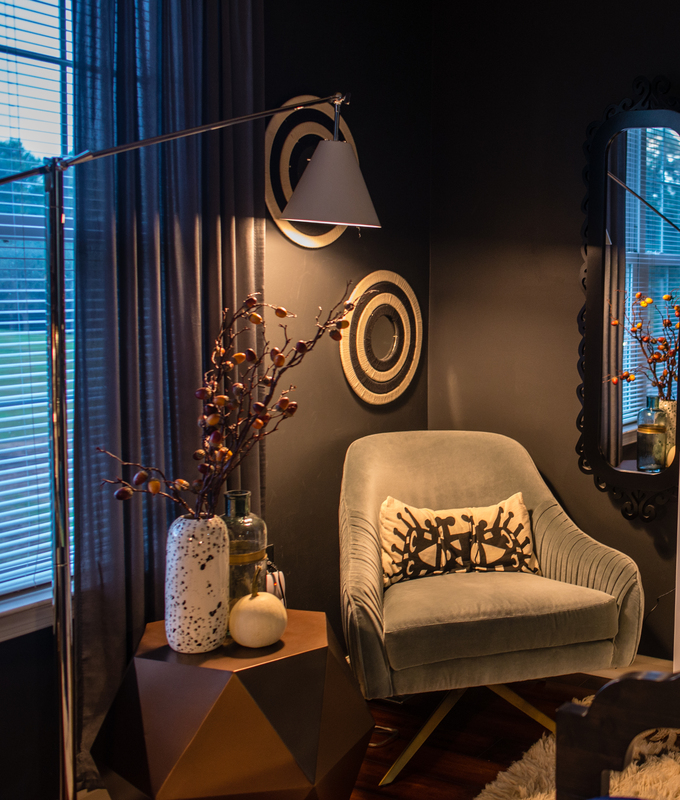 It’s a dark and dramatic room that Mel has added texture and pattern to visually lift this space. The pendant lights that hang either side of their night stands meant another trip to the attic to crawl through the insulation but I think you’d agree with me that they look fabulous against the tiled, yes you read that correct tiled feature wall behind the bed. The velvet chairs from Roar & Rabbit are my favourite reading or school work spot and I shrieked with glee when I found the Sonneman lamp to add light to mine. We each have our own designated chairs…. Mitch’s usually covered with his clothing!! It’s also the one room that presented the most challenges for Mitch as he had to reconfigure the plumbing to accommodate the black tub from Signature Hardware as well as creating a double vanity from a CB2 media stand to include two sinks and faucets again from Kohler. Mitch also laid the herringbone patterned wall tiles that will never date as well as tearing out the old fibreglass shower stall. He also figured out how to build the drain for their tiled shower floor all, I’m impressed to say, by watching YouTube videos!!! Now that’s impressive don’t you think? 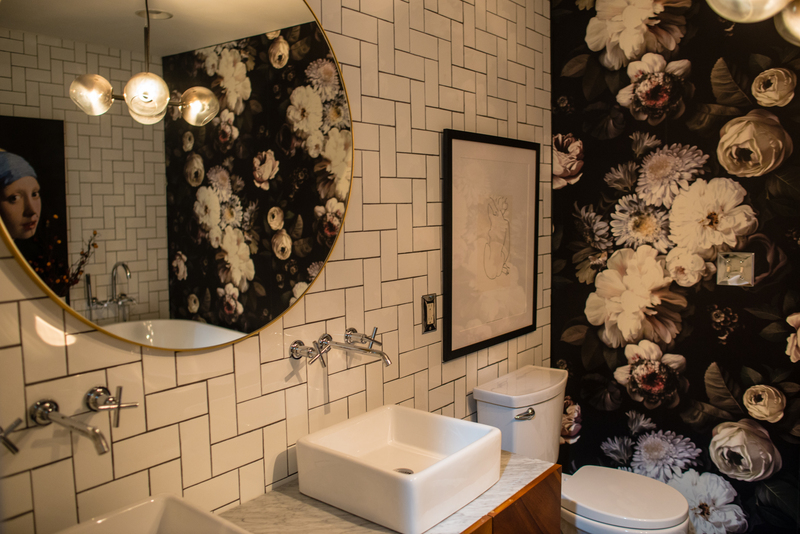 The simply divine Dark Floral wallpaper is of course by Ellie Cashman and Mel took her inspiration for their bathroom from this. I adore the fact that Mel also added artwork in the form of The Girl With The Pearl Earring which adds character and interest to what is already a pretty amazing bathroom. I’d leap at a bathroom like this wouldn’t you? Words cannot express how much I love this bathroom. This room is filled with the hardest projects I have ever asked Mitch to do and it truly feels like a love letter from him every time I am in it. What I love about Mel and Mitch’s home is that it is more than just a home. Each room has meaning that goes beyond its facade. The objects that adorn each space hold memories that are revisited and cherished. A carefully curated home is not always about buying stuff to fill it because it might say be on trend. Having toured Mel and Mitch’s home, it’s something that I myself have found myself reflecting upon especially in a society that has a thirst for change and throwing things away. I’ve teamed up with @Melmitchia, @happyeclectichome @9vintagegirlfinds over on Instagram to form @Greathomestaketime. For a chance to win a $40 gift card to spend at @9vintagegirlfinds and a home tour here on my blog, all you need to do is play along by using #greathomestaketime and follow us all including our page. Can’t wait to see all your entries and this competition is open worldwide! Oh I love a good home tour! You really get a sense of the charachters who live in the space and what a romantic space it is! You have me wistfully dreaming of the old romantic novels of times gone by! Thanks for sharing with us! How BIG was this house? Woa! Loved the tour so many epic pockets of style around it. My takeaway is: if you love something use it the way that it fills YOU with joy. 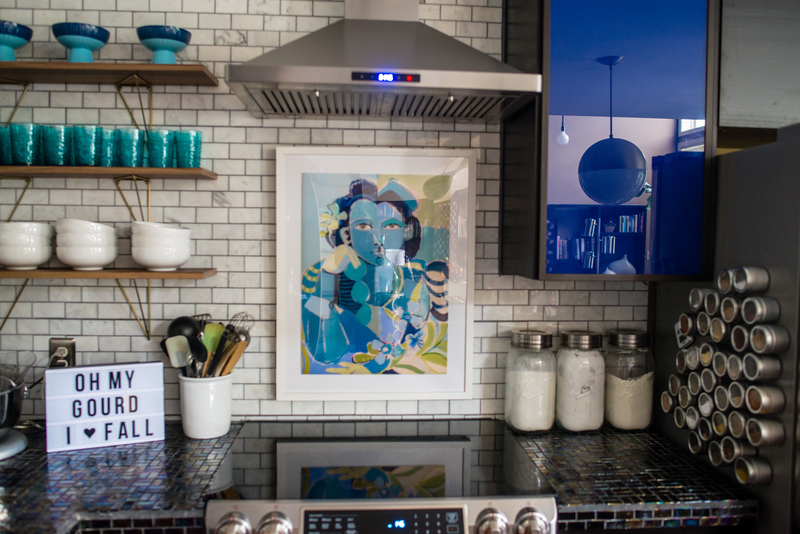 Want art above your range? Why the hell not, go for it! It’s your house, your rules!